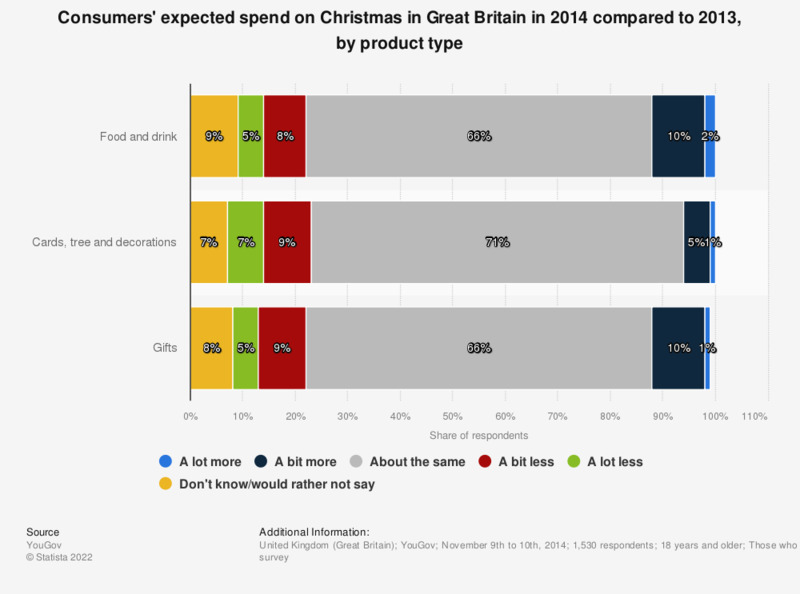 This statistic shows the spending expectations of consumers on Christmas in Great Britain in 2014, by product category. Categories include food and drink for consumption at Christmas, Christmas cards, Christmas tree and decorations and Christmas gifts for friends and family. Generally most survey respondents expect to spend the same as last year. Only 12 percent expect to spend a little or a lot more on food and drink, compared to 13 percent who expect to spend a little or a lot less in 2014 compared to Christmas 2013. How much do you intend to spend on Christmas cards, Christmas tree and decorations? How much do you intend to spend on gifts for family and friends this Christmas? How much do you intend to spend on food and drink for consumption at home this Christmas? Thinking about last Christmas, in total how much do you estimate you spent on celebrating the festive season (food, presents, decorations)? Personally, do you rather open your Christmas presents on the evening of the 24th or the morning of the 25th of December? If Santa Claus gave you 10,000 euros, how would you spend them?